One of Tesla’s many benefits is their ability to continuously update their vehicles through over-the-air software updates. They constantly improve their vehicles safety and add owner requested features making your car feel new again with each and every update. Here are just some of the latest Tesla software updates to come from the manufacturer. The current, most recent update is 2019.8.5, but don’t start to worry if you are behind. Tesla rolls out their updates in small batches. You can use TeslaFi to track current firmware progress and check out what percent of the Tesla owners fleet are on which firmware version. In a previous update, Tesla removed Pole Position from their list of Atari games and promised more to come soon. With this latest Tesla software update, we received not one, but two new Atari games. 2048 and Super Breakout have both been added to the growing list of games you can play on your Tesla. Not all games are available on all cars. For instance, those who have MCU 1, cars built before February 2018, never received Pole Position. There is no confirmation yet on whether some of these games will be limited to certain cars with this latest update. Tesla has finally released what they have been teasing for a while now, no confirmation Nav on Autopilot. Nav on Autopilot is a feature that allows you to go a full trip on the highway while on Autopilot. The car will make lane changes and maneuvers to get you on the right exits all by itself. Previously, this feature required a confirmation with the turn signal stalk to initiate a lane change that the car wanted to perform. With this latest Tesla software update, lane changes will now be made automatically as long as the driver has a hand on the wheel. You will be notified prior to the lane change via an audio, visual, or physical warning. With that warning you can either cancel the change or let the car proceed. This is just one step closer to a full self-driving Tesla but by no means is this full self-driving. 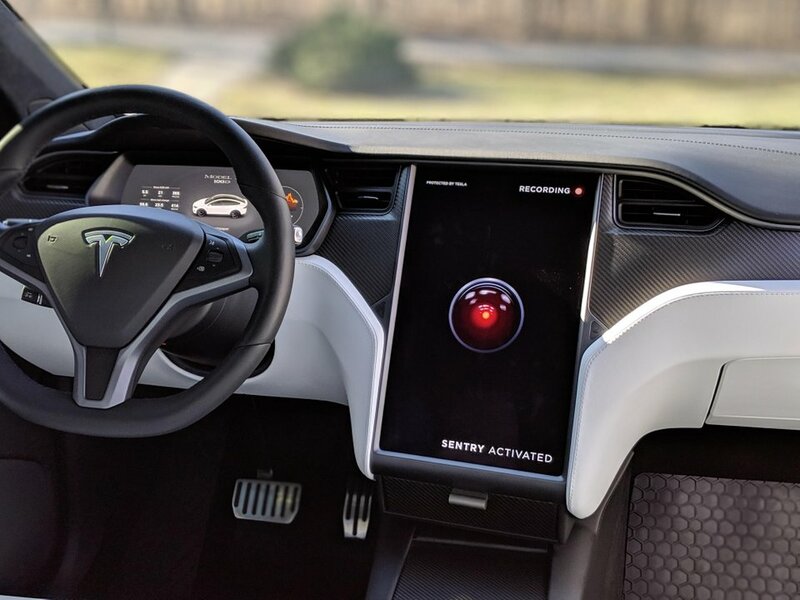 Back in January, we first heard of Sentry Mode and its wide release to all Tesla models with the previously availableEnhanced Autopilot package. Since then, its actual release has been a bit slow with the first sighting being almost a month after conception. Owners of Model 3s started to receive the update with S & X owners left in the dark. Now both models are receiving the same love as the update has finally begun to roll out fleet wide along with a few other neat features. Sentry Mode is a toggle-able security system. If anyone so much as walks by your car, it will turn on your center screen to show a “recording” message and activates cameras and senors to monitor any criminal activity. If criminal activity (such as a break-in) is detected, the car will trigger an alarm at full volume, increase display brightness, record the incident, and notify you via smartphone. You can then see the recording in your Teslacam. If you still have not set your Teslacam up, or need help doing so, check out this tutorial. Dog Mode is also being released alongside the Sentry Mode update to Model S and X owners. Your vehicle already has Cabin Overheat Protection, but with this new mode you can enable a screen that notifies any passersby that your pet is safe and the air conditioning is on. One new feature you probably have not heard of yet is Dynamic Brake Lights, a feature not invented by Tesla that serves as a useful safety features for both the driver and those around. This feature is currently only available in Europe, as U.S. regulations have yet to permit any dynamic brake lights in the U.S. The Tesla Model 3 has also received a peak power increase of about 5% for all versions. Owners around the globe are already reporting their vehicles feeling much faster. Range has also been boosted to 325 miles for the Long Range version and they have also increased the top speed of the Performance model to 162 mph through an over the air software update. The Model 3 was released with no key or fob. Instead, you relied on your smartphone or key card to unlock and start your vehicle. After some owner feedback, Tesla released a key fob for the Tesla Model 3 but unlike the Model S & X, it did not allow the activation of Summon. With this latest Tesla software update, Summon is now available to be used on the Model 3 key fob as well. The fob itself does not come with the purchase of a Tesla Model 3 but can but bought afterwards from Tesla for $150.